The server handles communication with the Fadecandy boards over USB. Because the Space Tunnel has 12 Fadecandys, I set up a config file to identify each one by its serial number. The server uses Open Pixel Control protocol (OPC) to send pixel data to each light individually. 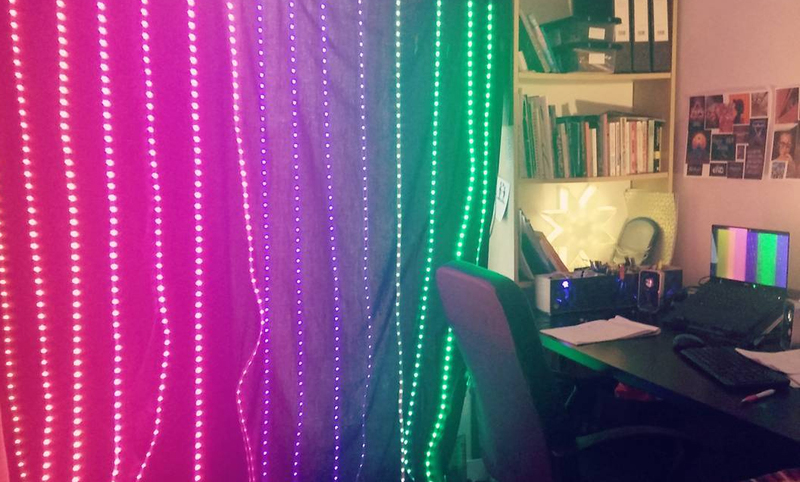 Using the OPC library for processing, the LEDs are mapped across the canvas, replicating their layout in the real world. Then, anything that is drawn onto the canvas is drawn on the lights. 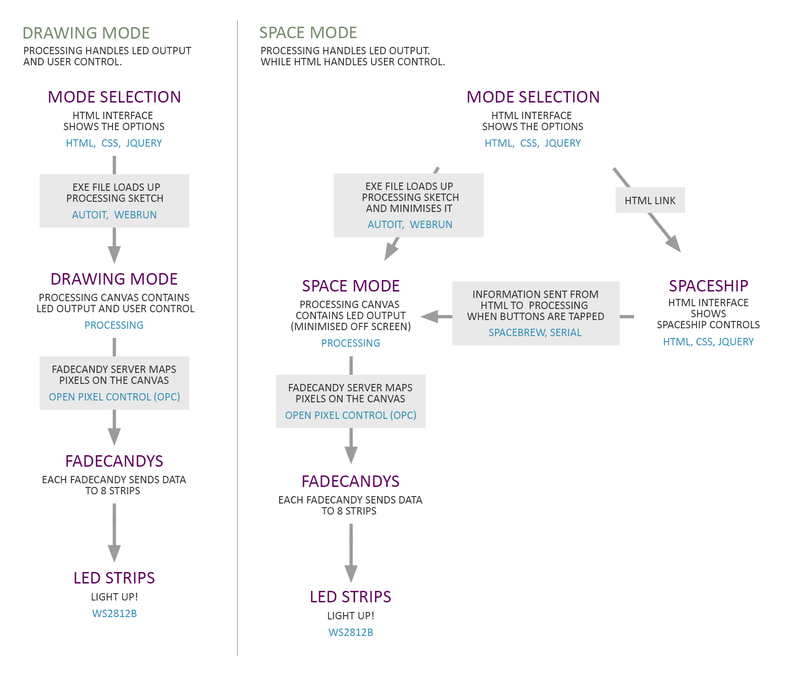 The Space Tunnel has a few different modes and each mode is set up as its own Processing Sketch. Being inside the tunnel feels like flying through the stars! 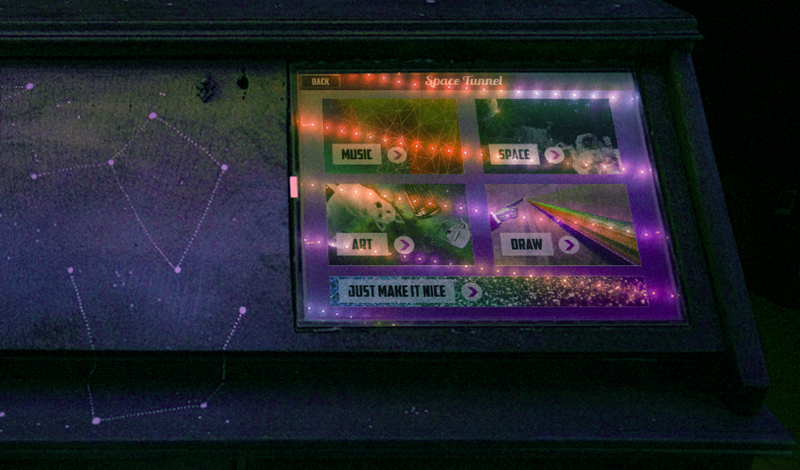 Anyone can use the touchscreen to change the speed, colour and direction of the stars. To allow anyone to control the tunnel and select modes, I designed an interface in HTML. 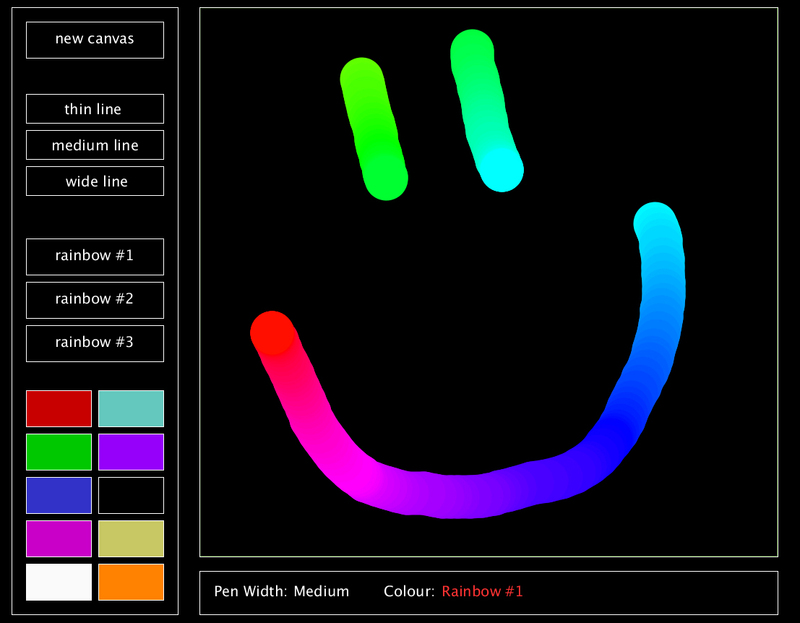 If Space or Drawing mode has been chosen, people can then control the lights using the touchscreen. 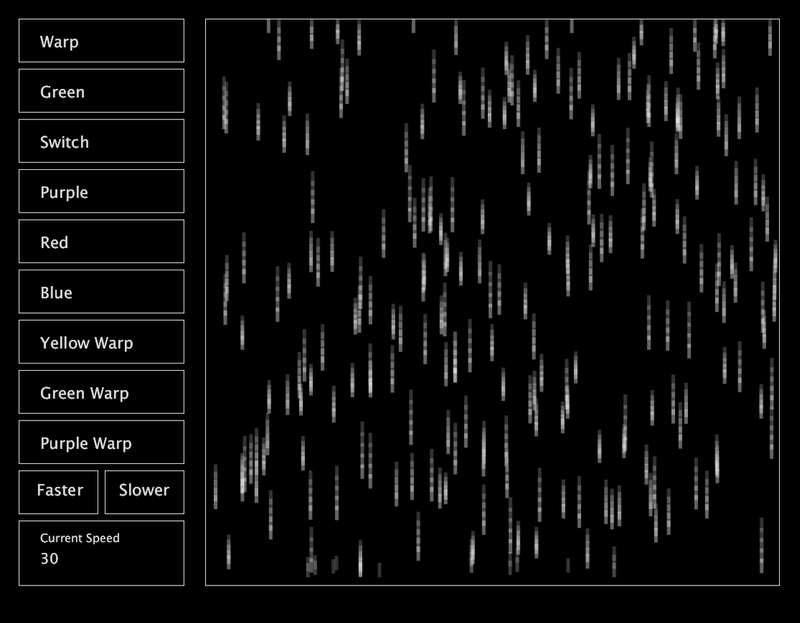 For the first outings of Space Tunnel, this was done with an interface created in the Processing sketch. This was limiting, because Processing is not really intended to create user interfaces, but it was the simplest way to let people control the lights. I have since set up an HTML interface to control the Space Mode, and used a tool called (coincidentally) SpaceBrew to send instructions over a serial connection between Processing and the browser interface. The visual design of this interface is still in progress, and I’m excited to see people use it on the Space Tunnel’s next outing. In this video you can see a prototype of the SpaceBrew control. On the left is the HTML interface, on the right is the Processing sketch. When a button in the HTML is clicked, an exe file (created using Autoit) runs which stops any Processing sketches which are currently running and starts up the one which has been selected. AutoIt also allowed me to do things like maximise or minimise the Processing window as needed, depending on which mode was being run, to provide a better user experience. Thanks to security issues (you can’t directly run an executable from a browser because that would usually be a really bad thing) it actually was a little more complicated, and I used a tool called webrun to allow me to do that.